The details on these Mercator models is nothing short of extraordinary. 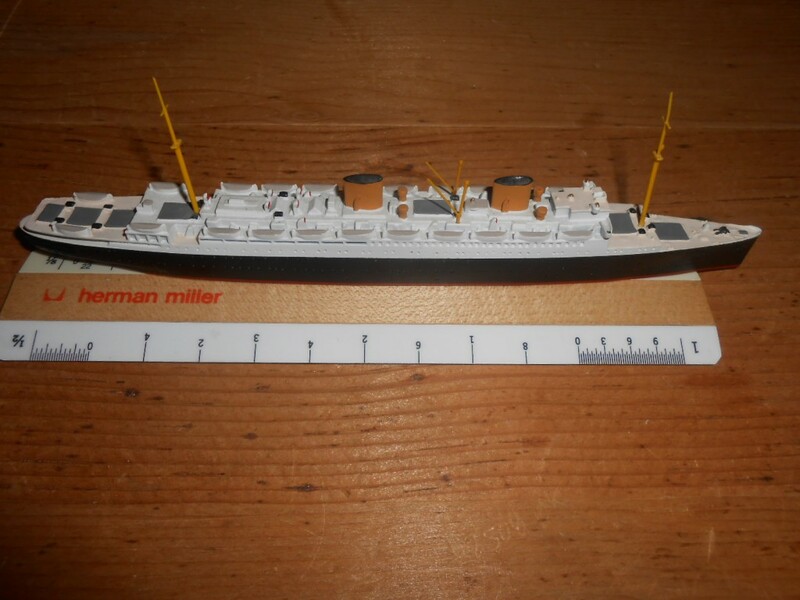 This is a lovely model of the Columbus … really the only liner (she was on the ways) left to Germany at the end of WW2. Originally to be named Hindenberg she assumed the name Columbus .. when her sister “Columbus” was given to The Allies and become the Homeric for White Star. The Columbus (now ex Hindenberg) was modernized in the late 20’s to keep up with the speedy new NDL racers … the Bremen and Europa. The Columbus was sadly scuttled by her German crew off the US coast to a avoid capture. Known for their minute and impressive detail, Mercator models are amazing!… Here we have the first of Ballin’s trio … the Imperator. The Kaiser was so impressed with the ship … he saw to it that the social hall had his bust displayed prominently. The model shows the Imperator very early in life … with the bow eagle and super tall funnels. The eagle lasted on a few voyages .. and the funnels were shortened in her first refit. Excellent condition! Stunning official NDL photograph of the racer Europa. 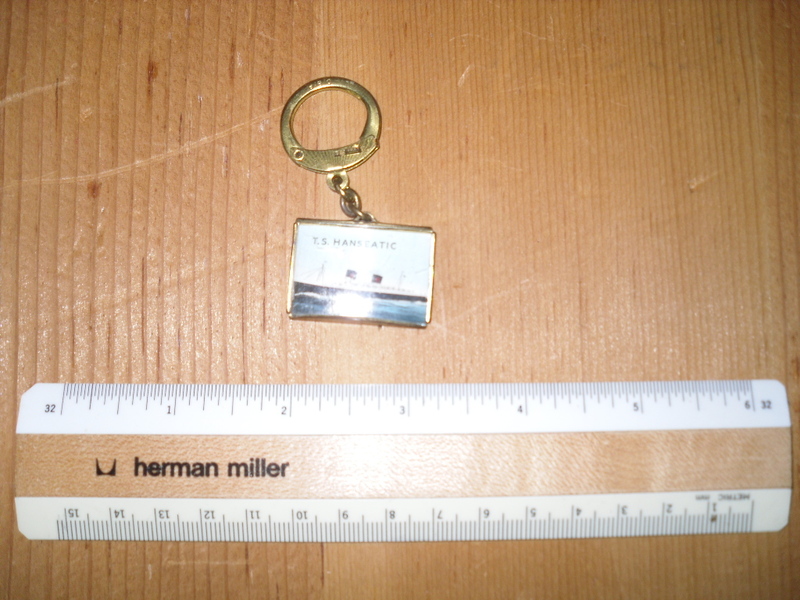 The back contains statistical typed info in German and English … as well as some handwritten German text. The Europa was almost destroyed while under construction by fire , but hre germans rebuilt her. She briefly held the speed record. The photo is approx. 7×7. The Image is crisp sharp and in wonderful condition. 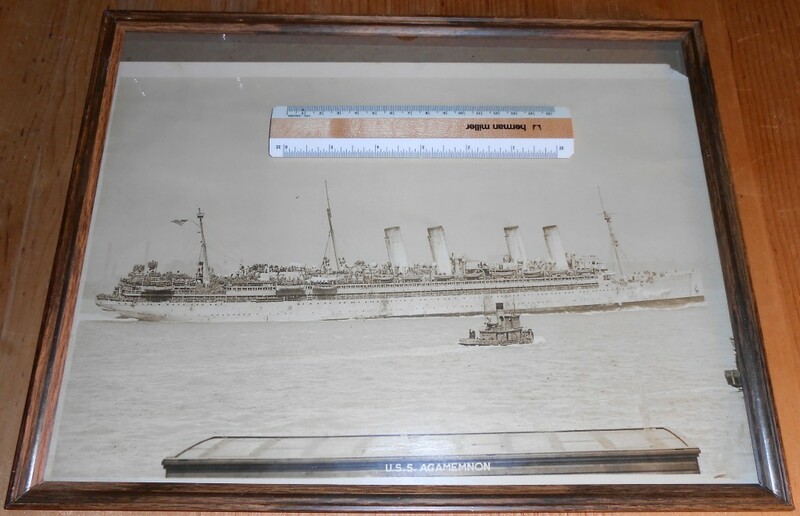 NDL’s 4 funnel racer was caught at the onset of WW1 … and quickly put into service for the US Navy as the USS Agamemnon. After WW1 There were schemes to reactivate her for peacetime service alongside the Leviathan and other German ships … but she was kept in the backwaters of the reserve fleet and never used again. She remained in the backwaters until after WW2 , and was towed away as a rusty old gal to become pins and needles for American baby boomers. There is a 1″ chip out of the upper right hand corner. 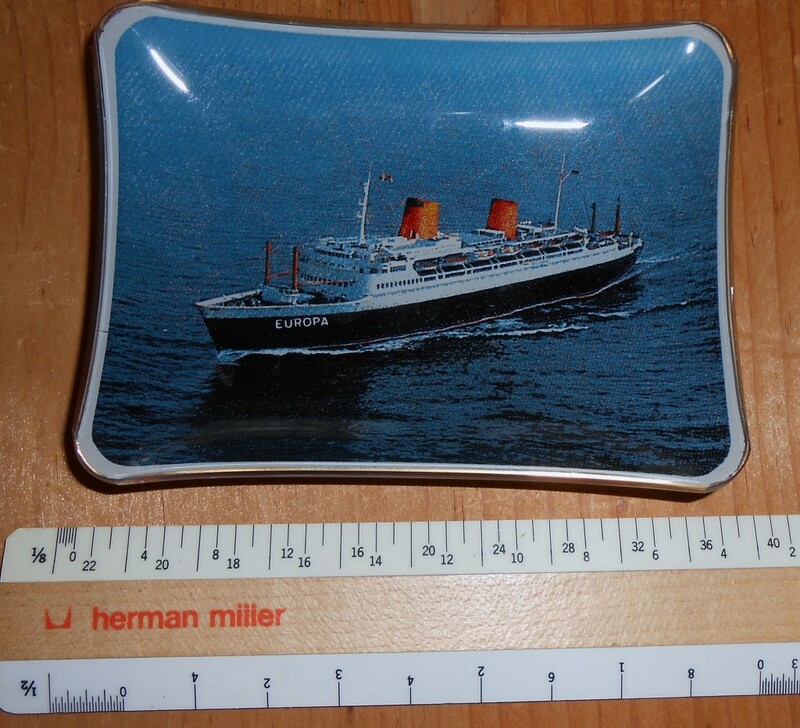 Lovely souvenir back painted glass tray for the Europa. She started life as SAL’s Kungsholm .. and joined the Bremen V ( rebuilt French Pasteur from 1939) in the early 60’s. In excellent shape with no chips scratches etc. Wonderful little booklet about the Bremen and her elusive dash out of NYC and homeward at the onset of WW2. She was painted grey at sea … and made it home to Bremerhaven via Murmansk. 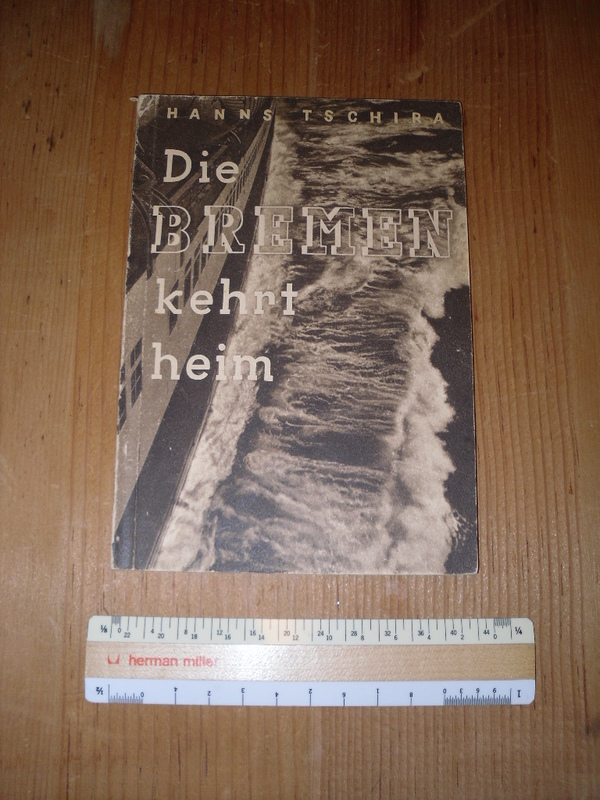 Great little German paperback …. Must have been important propaganda to publish this … paper and other materials sure would have been in short supply in Germany in WW2. The poor was Bremen burned out by the end of the war. Pretty rare little booklet… and neat photos! There is a tiny tear on the back cover does not detract in anyway. Germany was depleted of almost all of their shipping tonnage after WW1 … but NGL was able to get the Bremen back into service. A neat little ship … her name would eventually be reused with the sparkling and amazing Bremen of 1929 (and then the Bremen (rebuilt Pasteur) of 1959. 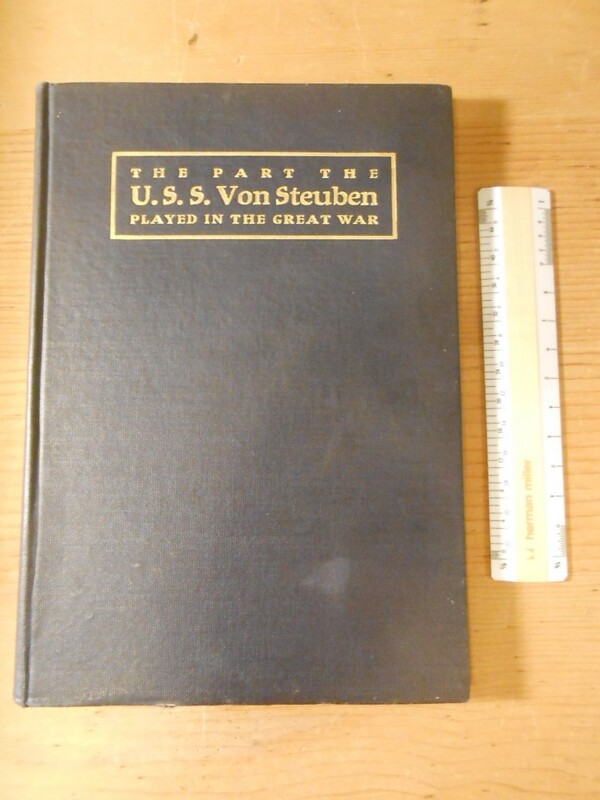 The plan certainly has browned, has some cello tape repair and a waterpoton a fold line … but Kind of rare to find something for one of the few members of the Post WW1 German fleet! This elegant little 1926 menu dates long before she would have joind the KDF fleet. 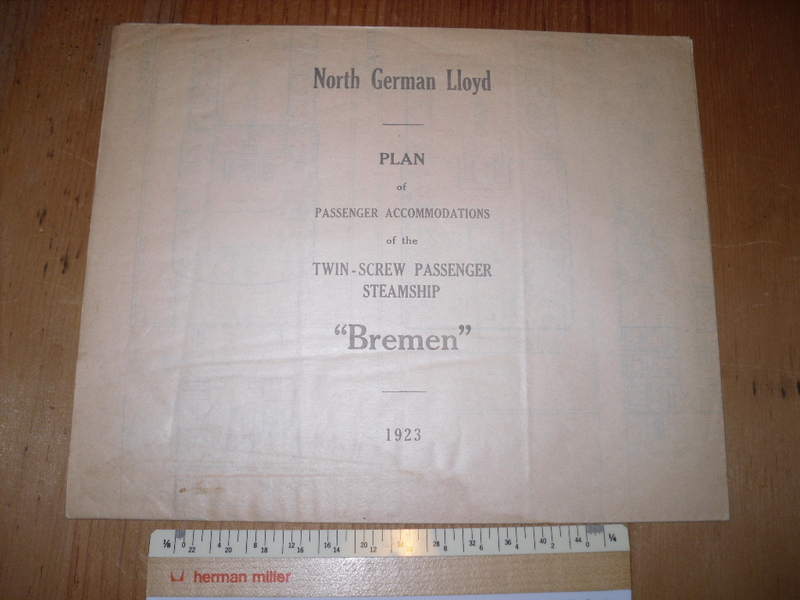 The menu is in German and English … the passenger must have been English … as they have checked items on that site of the offering. I would have had the potato pancake with mashed apples for sure! YUMMY! Nice little sheet and envelope from any member of the HAPAG fleet. 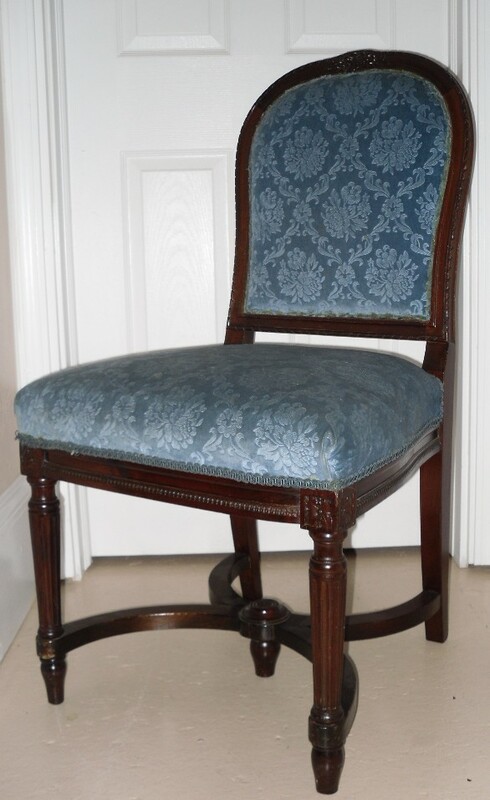 It has yellowed with age.. and have a few spots … but still entirely useable! Lovely little brochure for the German companions. 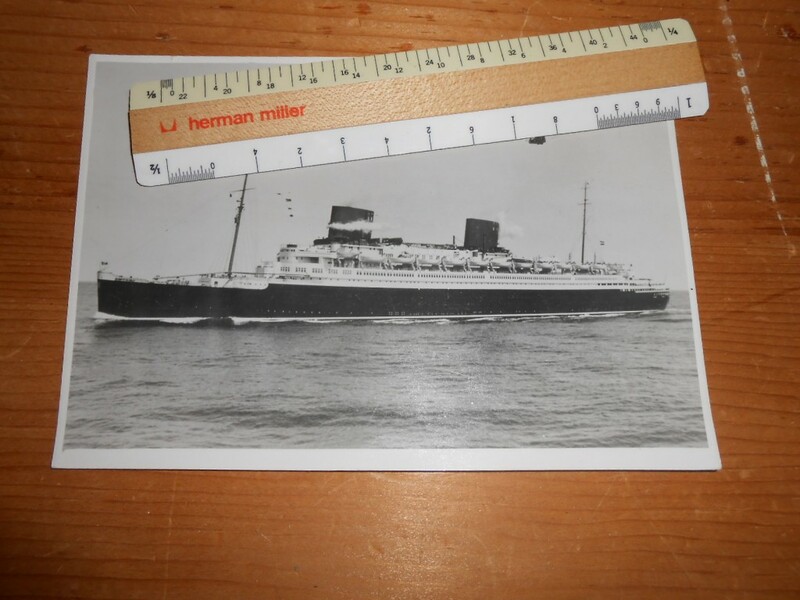 The Bremen was basically the pre WW2 French liner Pasteur rebuilt from the hull up …. and the Europa was the postwar SAL Kungsholm with a few tweaks including new wallpaper and paint. 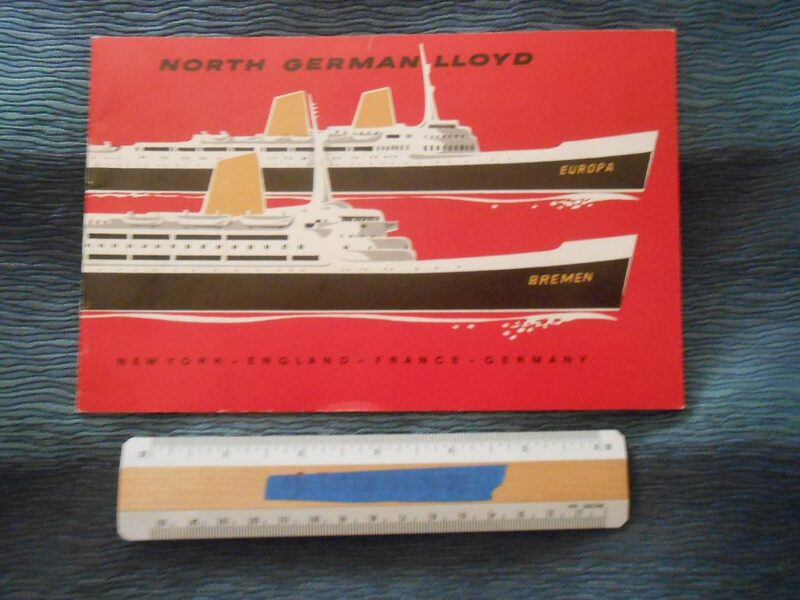 Full of great full page photos, this is a great little reference items for the ships. Awesome Bakelite ashtray for the German twin flyers! This was probably snitched from an onboard smoking room. 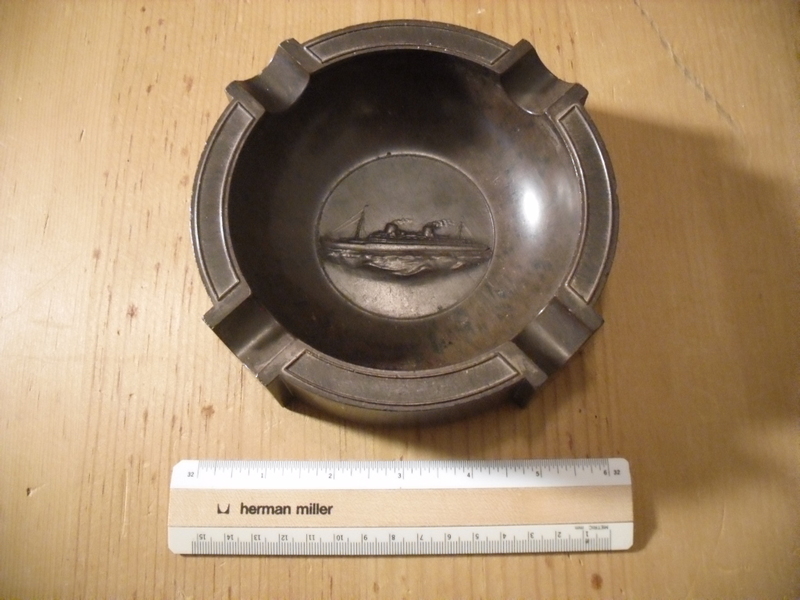 Great bas relief image of the ships in the bowl … sporting their lower funnels … so it must be a pretty early item. Glad somebody slipped this into their pocket or steamer trunk! 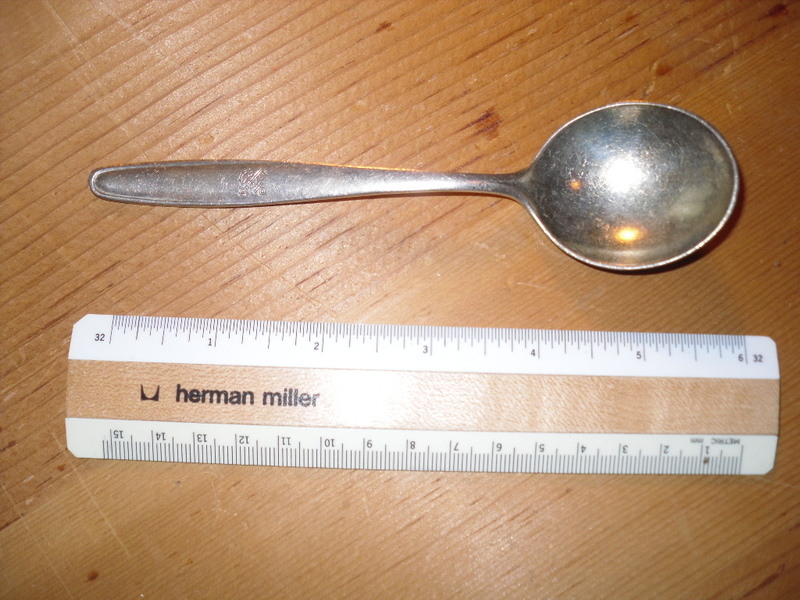 NDL: silver plated soup spoon. My guess is this dates from the 1930’s Bremen/ Europa/ Columbus era. 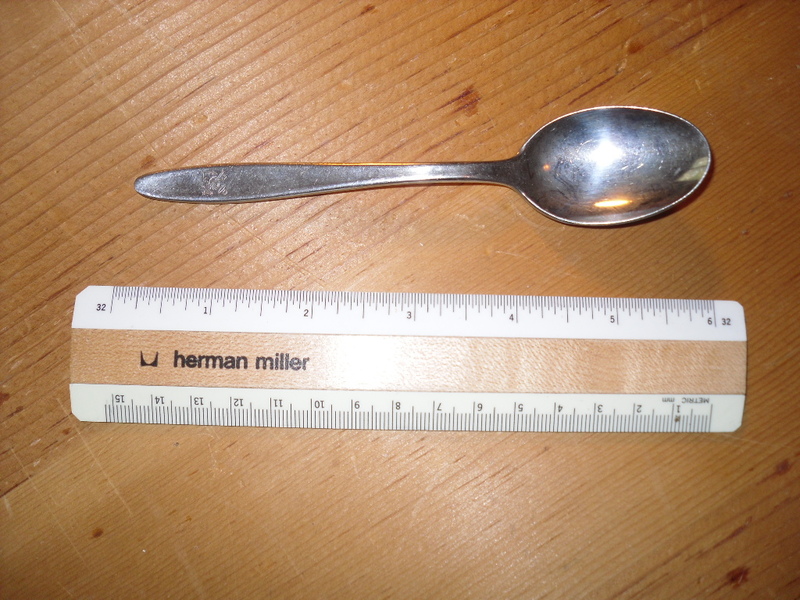 This spoon is heavy and has the key and anchor logo, Typical marks from use and onboard scullery visits! I am sure it will clean up nicely! 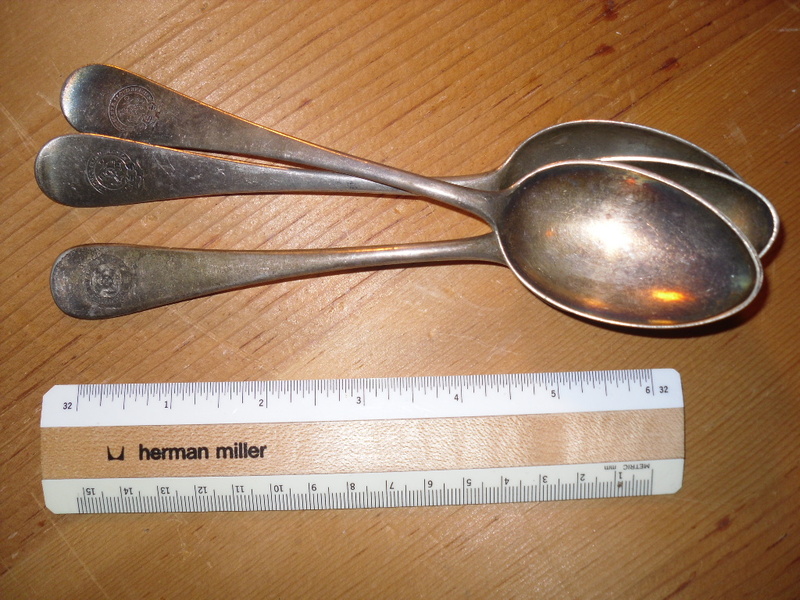 NDL: 3 Big Silver spoons. 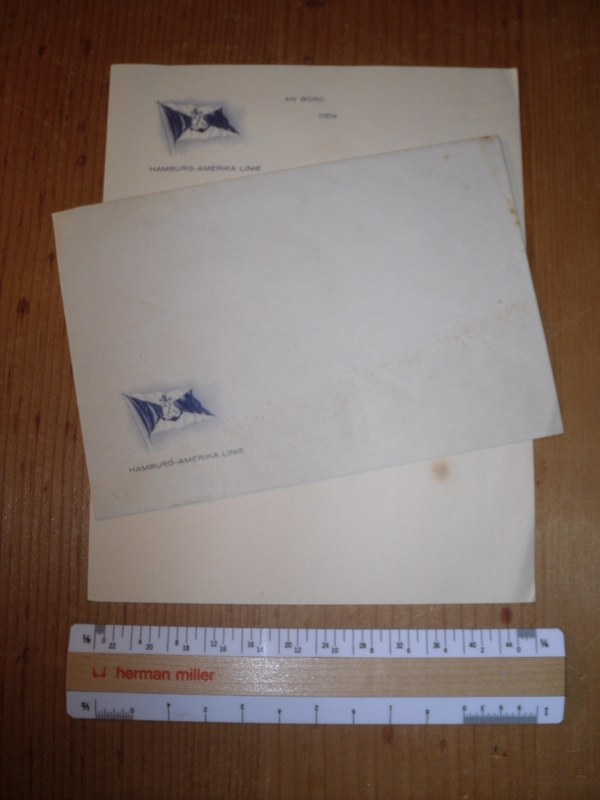 I have no idea what ship these are from … but my guess is they date from the 1930’s Bremen/ Europa/ Columbus era. 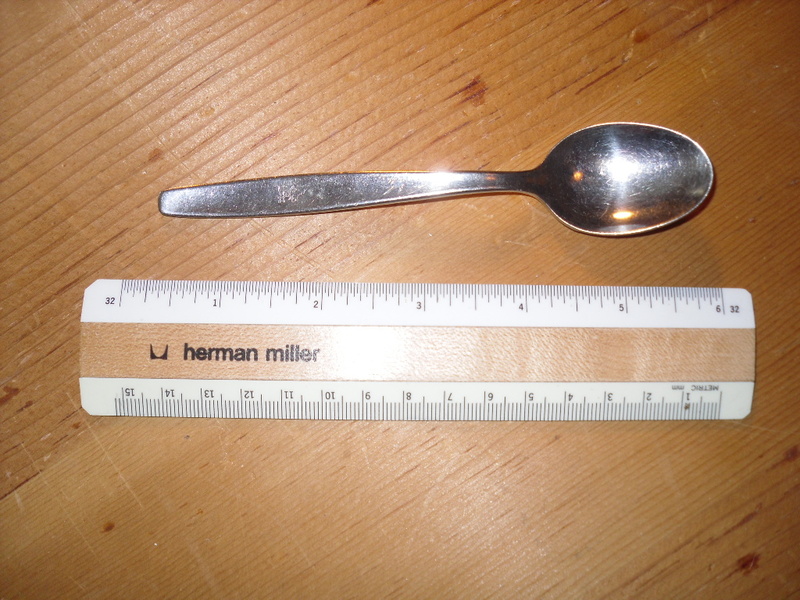 The spoons are heavy and have the key and anchor logo. Based on the little buffing I tried, I’m sure they willl clean up! Typical marks from use and onboard scullery visits! 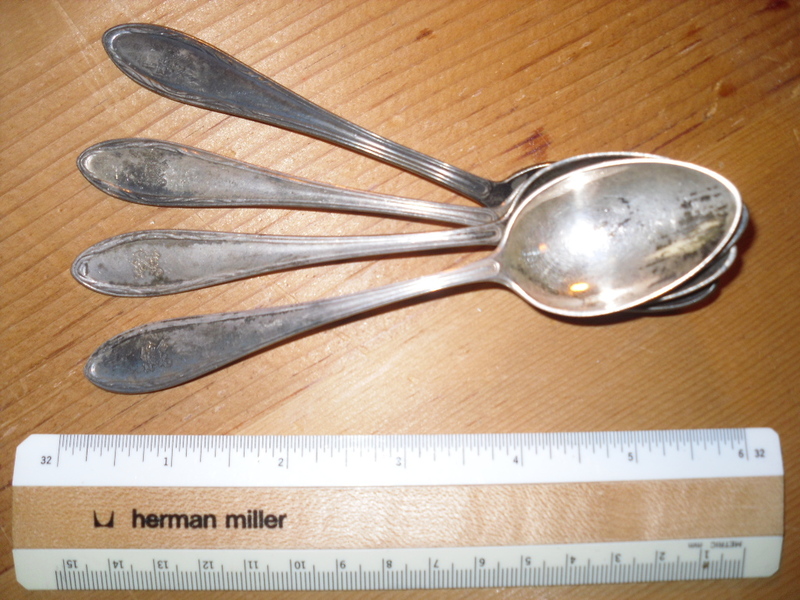 NDL: 4 Silver spoons. I have no idea what ship these are from … but my guess is they date from the 1930’s Bremen/ Europa/ Columbus era. The spoons are heavy and have the key and anchor logo w/ a little rope design around the edge. Based on the little buffing I tried, I’m sure they willl clean up! Typical marks from use and onboard scullery visits! 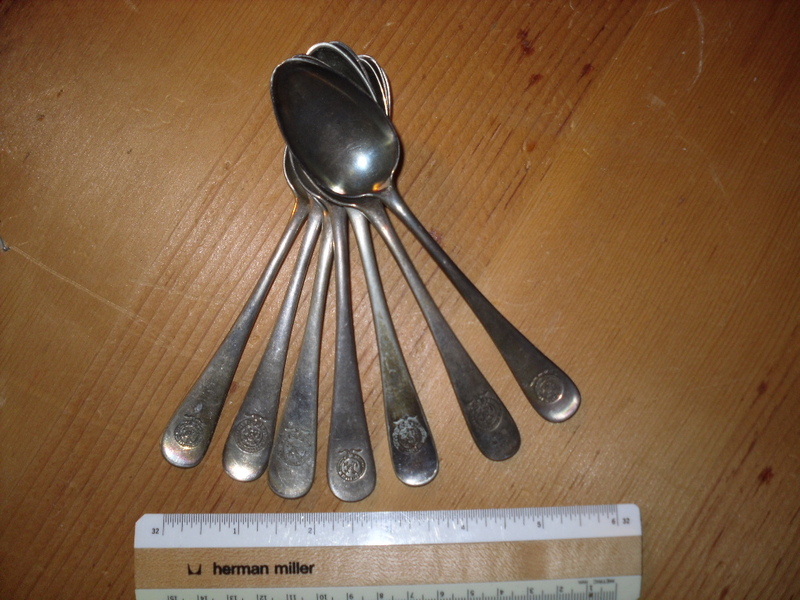 NDL: 7 Silver spoons. I have no idea what ship these are from … but my guess is they date from the 1930’s Bremen/ Europa/ Columbus era. The spoons are heavy and have the key and anchor logo. Based on the little buffing I tried, I’m sure they willl clean up! Typical marks from use and scullery visits! 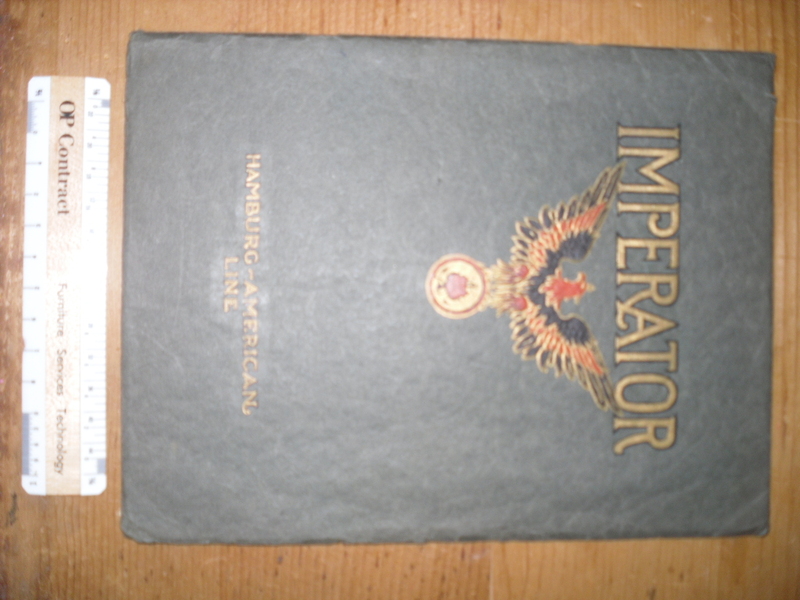 Hamburg American Line: Imperator. She was the first of Ballin’s big three and post WW1 became Cunard’s Berengaria. The famed cast iron eagle figurehead was short lived … the wings today are deteriorating someplace on the Atlantic seabed. 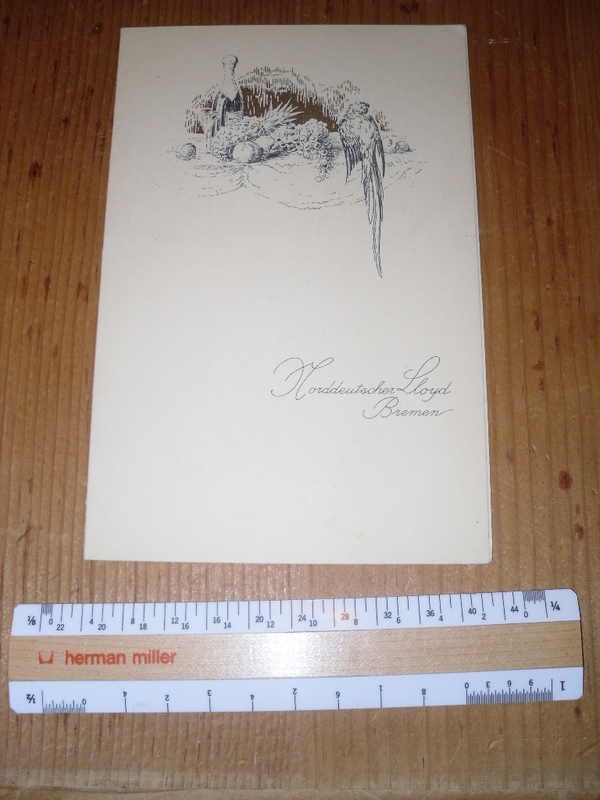 This is one of the most impressive and very early brochures for her … and filled with crisp German photographs. Just stunning! I saw a ragged copy of this sell on Ebay for $375 this past month.. this one is near perfect (only slightly chipped cover edges) and a much better deal! 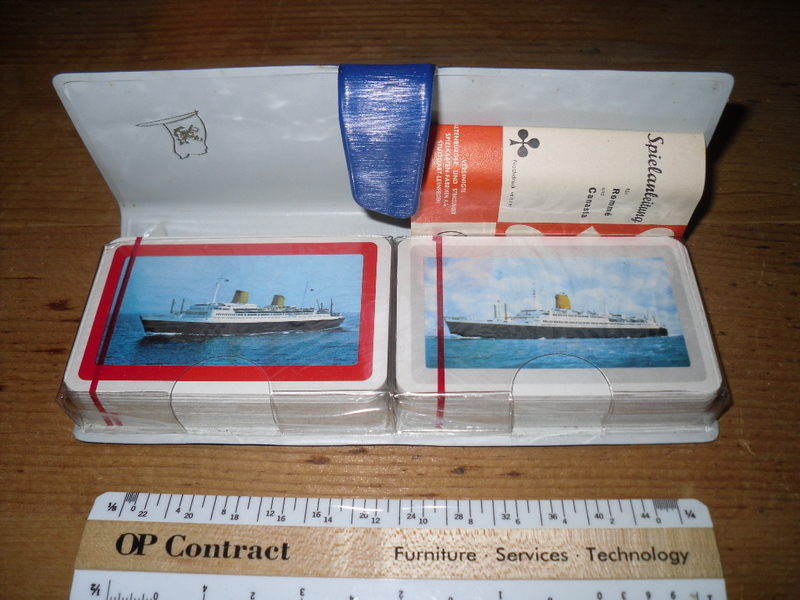 NDL Bremen5/ Europa: Mint unopened double set of playing card for the 60’s German Duo. NGL: Columbus : Passenger list and log. 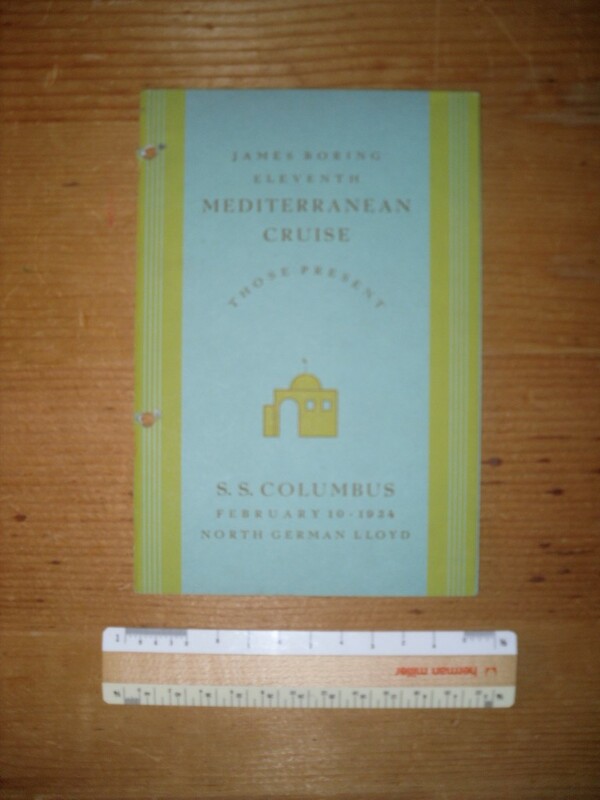 Very nice little Feb 1934 passenger list and log for the 11th Mediterranean cruise organized by James Boring. The list is in great shape: except someone did hole punch it and also folded a page corner at sometime in the past. The owner must have been a tourist class passenger.. there are red pencil tick marks next to several of the TC passengers and a name or 2 written into the list. 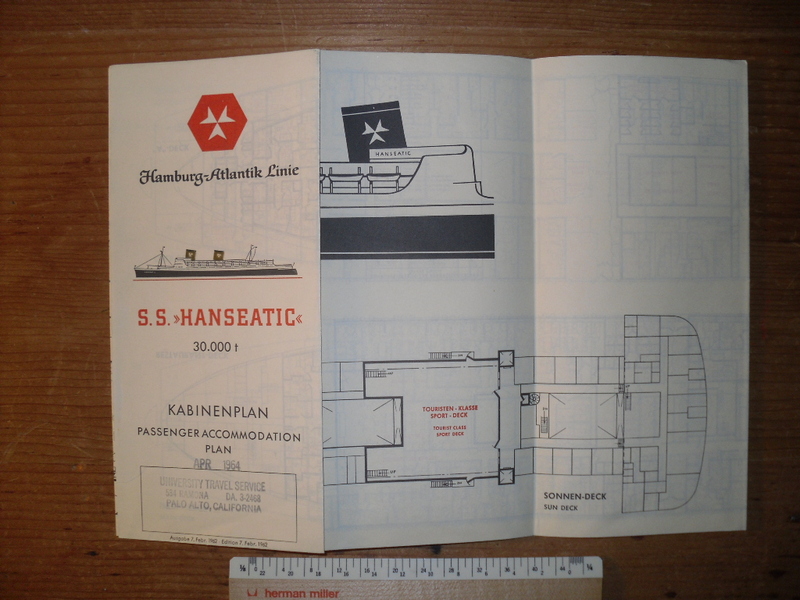 Nice folding deckplan from the early 60s for the Hanseatic. She was a very popular ship … till an engine room fire in NYC harbor cut her life short. She was quickly towed back to German and scrapped. The Zim line Shalom was quickly purchased as her replacement. Excellent condition w/ agency stamp.